1. The stability of the fullerenes Cn, with n = 24, 28, 32, 36, 50, 60 and 70. H. W. Kroto, Nature, 1987, 329, p.529. 6. A selective isomer growth of fullerenes, T. Wakabayashi, H. Shiromaru, K. Kikuchi, Y. Achiba, Chem. Phys. Lettsa., 1993, 201, p.470. 7. Electronic properties of C28 and Hf@C28 clusters, Z. i, B. Gu, R. Han, Chem. Phys. etts, 1993, 207, p.41. 10. Topological resonance energy predictions of the stability of fullerene clusters, M. Manoharen, M. M. Balakrishnarajan, Chem. Phys. Letts., 1994, 222, p.85. 13. Electronic properties of a cluster based solid form of carbon: C28 hyperdiamond, E. Kaxiras, . M. Zeger, A. Antonelli, Yu. Juan, Physical Revire B, 1994, 49, p. 49. 16. 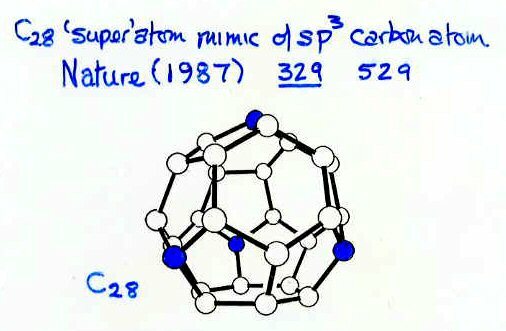 Theoretical study of cubic structures based on fullerene carbon clusters: C28C and (C28)2, L. M. Zeger, Yu Juan, E. Kaxiras, Physical Revire B, 1995, 52, p. 52. 23. Disordered and ordered C28 solids, J. Kim, G. Galli, J. W. Wilkins, A. Canning, J Chem. Phys., 1998, 108, p. 2631. 27. C28: a possible room temperature organic superconductor, N. Breda, R. A. Broglia, G. Colo, G. Onida, D. Provasi, Physical Revire B, 2000, 62, p.62. 33. Electron-phonon interactions in C28-derived molecular solida, N. A. Romero, J. Kim, R. M. Martin, Physical Revire B, 2004, 70, p.70. 35. Three-Dimensional Polymerized Cubic Phase of Fullerenes, A. P. Popov, I. V. Bazhin, Hydrogen Materials Science and Chemistry of Carbon Nanomaterials NATO Science Series II: Mathematics, Physics and Chemistry Volume 172, 2005, pp 329-332. 38. Computer design of novel diamond-like crystals of fullerenes C28 and C40: Stability, crystal structure, and elastic and electronic properties, A. Enyashin, V Bekenev, L Ovsyannikova, Yu Rogovoi, A Pokropivny, V Pokropivny and Ivanovskii , A. L., 2008 ?? 43. The Smallest Stable Fullerene, M@C28 (M=Ti, Zr, U): Stabilization and Growth From Carbon Vapor, Dunk, P. W.; Kaiser, N. K.; Mulet-Gas, M.; Rodrigues-Fortea, A.; Poblet, J. M.; Shinohara, H.; Hendrickson, C. L.; Marshall, A. G.; Kroto, H. W. J. Am. Chem. Soc. 2012, 134, 9380-9389.